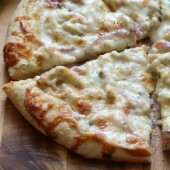 Thin crust three cheese pizza with chicken, onions and a creamy garlic white sauce. A perfect addition to pizza night! I totally forgot to bring headphones to the store…again. On the bright side, the store was practically empty anyway, but it still would’ve been amazing to listen to music. I’m sure I’ll get funny looks whenever I finally remember to do it. I still can’t get over how weird this winter has been so far. DC is currently getting slammed with several feet of snow, while we’re only expecting a dusting in southern New Hampshire… or maybe a few inches at most. This is just wacky all around. I’m not really complaining. Having been through storms that dump 2-3 feet of snow, I totally feel for everyone getting hit by the blizzard. It’s a lot to deal with, especially at once and even more so, in an area that isn’t familiar with significant storms. If you’re in the path of the storm, I hope you’re able to stay in where it’s warm and safe! Everyone has storms agendas, but my usual go-to is curling up by the fire, watching a movie (Harry Potter marathon anyone???) … all after throwing together an easy slow cooker dish. 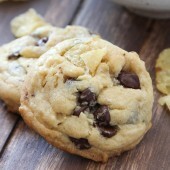 If you’re looking for any ideas, be sure to check out the recipe archives! You’ll find a fun and flavorful collection of simple slow cooker dishes, perfect to get you through a storm or just a chilly day! 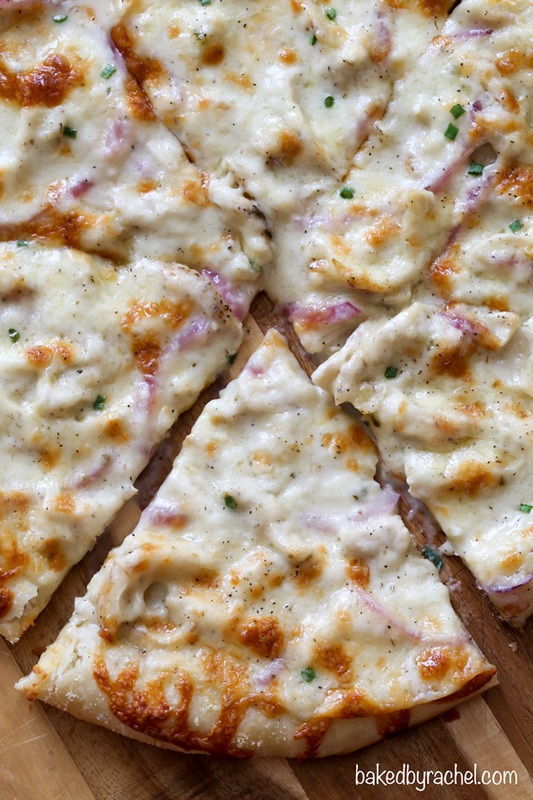 Of course, it’s pizza Friday so… pizza should also be on the agenda! I mentioned the other day that you’d be needing this simple homemade white garlic pizza sauce for today. Now you know why! It’s a must make. 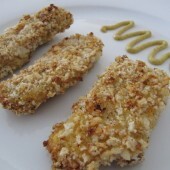 The combination is incredible, creamy and flavor packed! 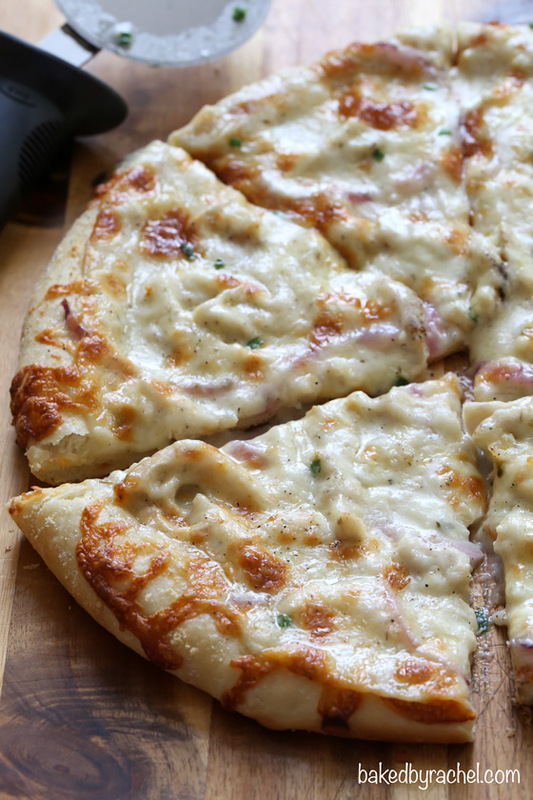 An easy homemade thin crust pizza, topped off with creamy white garlic pizza sauce, chicken, onions and three types of cheese! 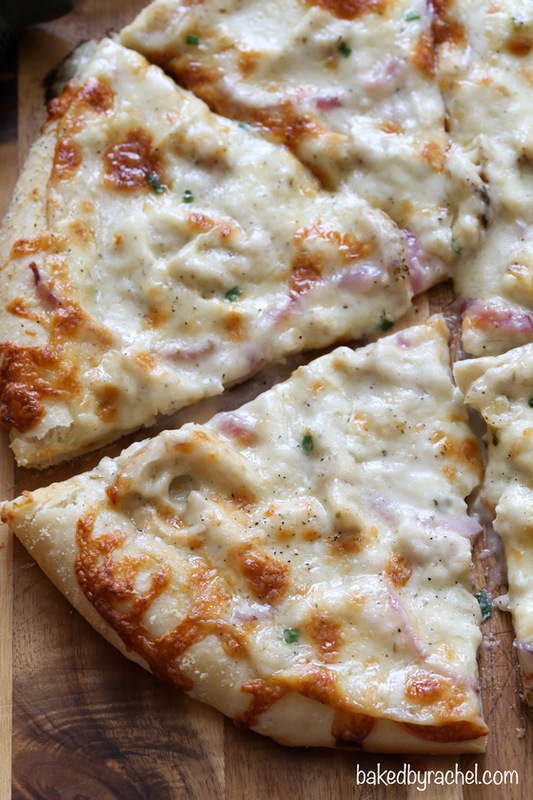 If you love white pizzas, this one should definitely be bumped to the top of your list! 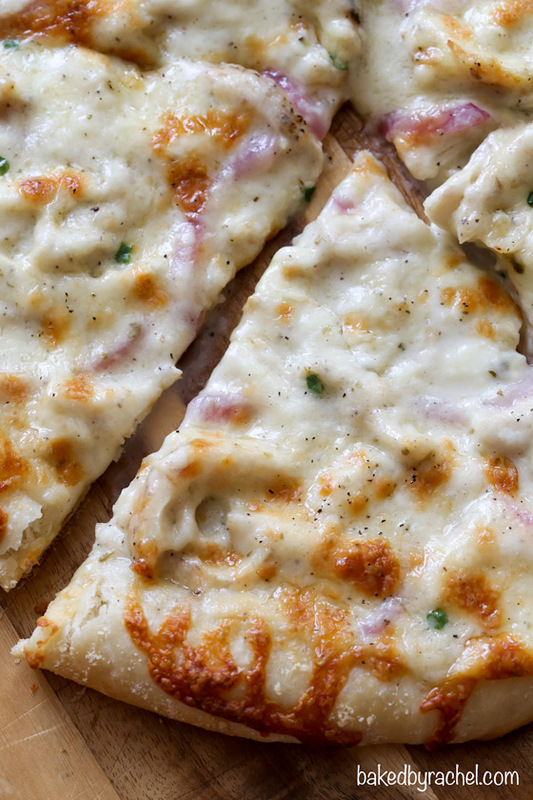 Be sure to add this tasty three cheese chicken pizza with garlic white sauce to your pizza night plans! Heat water to 115°F. Dissolve yeast and sugar in water, allow to proof for 5-10 minutes. Combine flour and salt in the bowl of a stand mixer with dough hook attachment. Alternately dough may be mixed in a medium bowl by hand. With mixer running on low, slowly add yeast mixer. Increase speed, mixing until a ball forms. Add additional flour or a drizzle of olive oil as needed. Transfer to a greased bowl. Cover and allow to rise in a warm location for 1 hour, or until doubled in size. On a lightly greased baking sheet, shape dough into a 10-inch circle. If dough springs back, allow to rest for several minutes before proceeding and continuing to shape. Spread garlic white sauce over the dough. Sprinkle with Paremsan cheese. Top off with shredded chicken and optional red onions. Sprinkle with mozzarella and pepper Jack cheese. Dust with black pepper. Bake for 20-25 minutes or until desired crispness is reached. Top off with chopped chives. Allow to rest for 5 minutes before slicing and serving. Recipe serves 3-6, yields 1: 10-inch pizza. I came to see how that sauce was going to pan out :) I LOVE IT! This has got to be such a delicious pizza. With having the sauce already made that it one step already done! I could go for some snow here This has been the strangest winter in CT. We’ve had some extremely warm days and only a dusting once. It’s cold now but if it is going to be cold, I want some snow that sticks around so I can go snowshoeing. This looks amazing. I love white pizzas. It would probably go on my list if I hadn’t already made 3 shopping trips to prepare for this darn blizzard in DC. I just hope we don’t lose electricity. I would gladly join you for a HP marathon and pizza night! We always have pizza on Fridays… but I have a confession. I’ve never had a white sauce pizza. This one looks awesome and I can’t wait to try it! I love your “storms agenda” – though I’d opt for pizza over a slow cooker dish – especially when said pizza is slathered with that white garlic pizza sauce! Deeelicious! This pizza, a movie and my sweatpants is the perfect Friday night! I knew you wouldn’t disappoint with an awesome pizza with that sauce! This looks incredible. 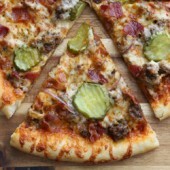 My hubby does a similar pizza too…now I’m totally wanting to stay in tonight and make pizza! This is my kind of pizza! Love all the cheese and I prefer white to tomato sauce! Looks incredible! So glad to hear you enjoyed it, Jenni! OMG I love this pizza. I switched the amounts for the pepper jack and mozzarella cheeses but that was the only change. Next time I’m going to try it with shrimp. Thank you, thank you, thank you.